Student loans are probably the best loan rates on the market. However, although the rates of interest are excellent that does not make repaying student loans any less stressful. Students that leave university or college with around £20,000 worth of loans can end up making repayments for a great number of years. Student loans are loans with a very low interest rate that are repaid once a student has become employed. Student loans have a deferment period if the salary earned is not over £15,000. The recent changes to student loans means that students can now borrow a lot more but will also have to pay the loan back quicker. Loan repayment rates are now set at 9% and taken directly from salaries. As students loans do have very low interest rates the reality is that they should be the last debts to be paid. If a student has left university with a large number of debts then it would be wise to apply for a student loan payment holiday. Under the new student loans repayment scheme students can now take a five year payment break. This will only be available to students that are due to start repaying their loans after 2012. By taking this payment break students can focus on repaying debts with higher interest rates, and will give a breathing space from student loan repayments. Student loans have to repaid sooner or later but the low interest rates mean that later is a better option compared to higher interest debts. There are options that students can use to consolidate all of their debts including student loans into one loan. The consolidation can include any credit card debts, student loans and other loans, and overdrafts. Banks will usually offer these consolidation loans under the title of a graduate loan. Graduate loans do not have to be repaid until the student has begun to earn a salary, and interest rates are usually quite low. 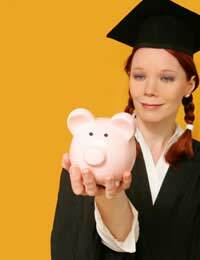 Always shop around to obtain the best interest rates available on any graduate loans. Student loans are deferrable if the student is earning less that £15,000 per year. It is very important that students who are deferring return the application that will be sent to them each year. If a student is moving house they should notify the student loan company. There really is no point in hiding from repaying student loans. There are many ways that loan companies can use to find a missing student. If the loan company has to come looking for the missing borrower they can apply extra fees and additional interest. The borrower is now over 65 years of age and if the loan was taken before 2006. The loan will be written off 25 years after 1998. Loans can be written off if the borrower is permanently unfit for work. In the past, not repaying student loans would not have made any difference to a credit reference file. However, there are new moves to include any missed payments and defaults on credit references. These can then be viewed by lenders when they are making a decision to lend credit. If students can afford to make payments then it will be in their best interests financially to make sure their credit file is spotless. Repaying student loans can be very stressful; these debts can sometimes be huge and eclipse any other debts. Information and advice for students that are struggling to cope with repaying loans or with any form of debt can be obtained from their student advisor, a Citizens Advice office or a credit counselling service. Wilfully avoiding repaying student debts is not a wise option and student advisors will try their best to help with any debt situation. In many cases graduates will earn enough to cope with repaying student loans. If they do not earn enough then this is where the deferment option comes into play. Although it may be hard to achieve, the graduate should try to avoid the temptation of accumulating more debt but should concentrate on repaying existing debts. It could take many years before a graduate is debt free but hopefully their salary will be sufficient enough to cope with repayments.